I have been on a French kick lately. Right now, anything French is cool. I have this grandiose idea of living in Paris, I want to learn to speak French, I want to eat French food, I want to bake French pastries, I am currently reading My Life in France by Julia Child – the list goes on and on. Not sure where all this originated, though I have a suspicion it started after watching Midnight in Paris, which now reminds me of the time I had a very strong desire to live in Spain after watching Vicki Cristina Barcelona… don’t put shiny objects in front of me, I will follow them. 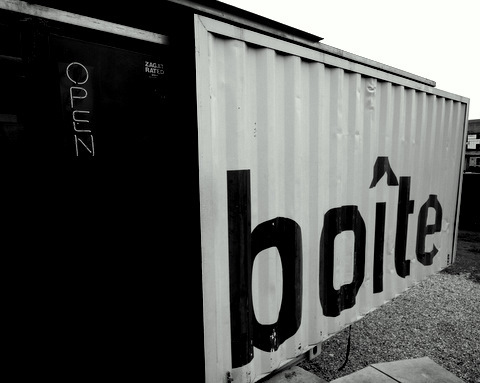 So I was quite excited to go to La Boite, the French eatery on South Lamar that is housed in a shipping container. Boite is a French word that literally means box and that is exactly what the place is – a rectangular box. I love that they have taken the “Reuse Reduce Recycle” motto to heart and used an object that was built for such a specific purpose and repurposed it into something quirky and fun. Sometimes my imagination can go in all kinds of silly directions and I started wondering: Where has this shipping container been? What exotic places has it traveled to and how did it arrive here? By boat? By rail? What precious cargo did it contain? Well I can tell you what it contains now – a whole lot of yumminess! And will someone please tell me how I have been alive for 40 years and just now have tasted my first macaron??? Oh my, those little French cookies are like fluffy pillows filled with pure sweetness. I tried two flavors – Pistachio with chocolate ganache and salted caramel. If my life depended on it, I still couldn’t tell you which one I liked more. They were both divine. I also enjoyed the almond croissant, which was crispy on the outside, chewy on the inside and absolutely wonderful. In fact, while I was there a person called in to ask if there were any of those croissants left. Since they only had two, the caller asked to please please please hold them – they would be over immediately to grab them! So they must be in high demand. 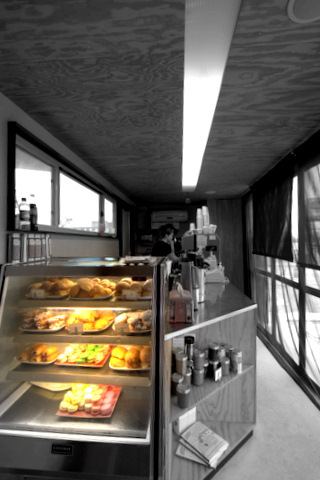 La Boite also serves great coffee, teas and sandwiches, so I plan on making a trip over there during lunch. Since the box is tight on space (though so cute), the seating is located outside under a shade canopy. If you’d rather just pick up something to go, the parking is convenient and easy. They open at 7:30 am on the weekdays, 8 am on the weekends and close at 4:30(ish). They have also just opened up a second location at 1006 Congress Ave. So my French obsession has been reinforced, thanks to La Boite. Hopefully I will one day find myself in France but until then, I intend on eating every macaron flavor they make. Bon appétit! Their Americano is one of the best I’ve had in town. It’s a neat location, far enough back from the main road and high enough up to see downtown off in the distance. Worth checking out! Being French is cool, so I like to repeat to myself.